Following the Uzbek oppositionist Bakhodir Choriyev’s announcement of “launching a ‘velvet’ revolution in Uzbekistan,” fierce debates are raging on Fergana. Our readers’ opinions differ drastically, yet all share the same caveat—while the Republic of Uzbekistan is on the brink of significant changes, it is very difficult to ascertain just what they will be. According to Ms. Ibragimova, no institutions appeared in the Uzbek society, which would provide modern political and economic education. Au contraire, arbitrariness and corruption on part of officials and power wielders are paving way for hatred, violence, and desperation. Where could the common citizen go to complain about his problems? To God alone! That is how Islam’s influence is increasing. Despite all the efforts the authorities apply, the Islamist movement will only gain momentum, she believes. Blogger Yadgor Norbutayev maintains that observers should expect not a “velvet” revolution, but a full-scale bloody revolution in Uzbekistan. According to Mr. Norbutayev, the current Uzbek regime is currently “active,” meaning its capacity to retain power are still vast and its potential to do so is unchecked and unmatched. “First, the mentality of the population directly creates favorable conditions for that. [Because] they are, in their absolute majority, timid and frightened. Especially in the countryside, who have no other imperative but unconditional submission to any kind of authority. The authorities, in their turn, continue encouraging and maintaining such a modus vivendi, which was almost declared a national tradition—patience, subordination and unpretentiousness. “Second, the regime managed to gain support of significant numbers among the population, who enjoy certain privileges: lawyers, police, tax and customs officers, officials, “members of parliament,” and other similar people. They are obviously not interested in any form of change of the current order. “Third, the humongous repressive and punitive apparatus, whose tasks include providing a reliable security of the head of state personally and his myrmidons. The aforementioned bloody revolution must be expected in Uzbekistan immediately after the Taliban show the NATO the exit door. They will then firmly grip power in their land and then will send small details carrying AK-47s on shoulders and emissaries carrying Korans in hands will launch a deep penetration into the “Sunny Republic” of Uzbekistan. Mr. Khayot Khan Nasriddinov maintains that the country was ready for a revolution in 2005. He says sprouts of revolution broke the ground in Andijan when people took to the street demanding justice and changes, but that attempt to replace then incumbent authorities failed. However, the revolutionary process lives on, albeit currently frozen. According to this analyst from Tashkent, an unexpected mutiny will break out sooner or later. 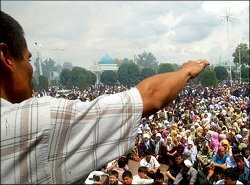 A reader from Bukhara shared the following: “A ‘velvet’ revolution is probably impossible in Uzbekistan. Everything rests on the people’s consciousness, after all. The Uzbek population is so depoliticized it is ready to absorb any idea, like a sponge. “In case the current authorities are toppled, everything will depend on the level of PR this or that presidential contender receives. His own or his team’s ideas for the masses will carry no significance or importance because any outcome can be served as an expected result. “Also, one must dismiss illusions about the relative literacy of the majority of the population. The average Uzbekistani lacks education, reasoning, and outlook that help one shape some kind of independent opinion. Especially those who were brought up on the ‘ideology of national independence,’ refusing to accept the reality and glorifying the made-up history. That said, this is a very significant portion of the society: the youth, perhaps one-third of the population. The majority of youngsters under the age of 30 do not even have basic understanding of how a statehood is ought to function. They are incapable of understanding simple terms, such as, for instance, secularization or totalitarianism, which are self-explanatory for an educated person. Alas, that is equally true for a farmer in Surkhandarya and a young official at the Andijan Regional administration. “Also, one has to realize that there is no working class in Uzbekistan. A peaceful, ‘velvet’ and bloodless revolution cannot happen at the hands of the crowd. Masses of educated people, who enjoy some sort of benefits and want more of those, must be involved for that purpose. There must be supporters of a secular democratic statehood, supporters of humanism who clearly realize the consequences of their actions and have a clear understanding of what they want. “No, it is not time for revolutions. We must grow; establish at least a likeness of a middle class. It would be foolish to deny the social growth and self-identity on the rise in Uzbekistan. Perhaps they are taking place at a tempo and in an environment we do not like. But [we have] the most important [factors]: the [shining] sun, the fresh air, the good soil, a peaceful period, the secular statehood, and the global trends of interpenetration of ideas. Therefore, the Uzbek government’s policies are benefitting us by employing known methods [presumably torture] and censorship to sift away most hazardous phenomena in the society.